My roving spun into yarn! Howdy everyone! Wanna see something soooo cool? Remember this? 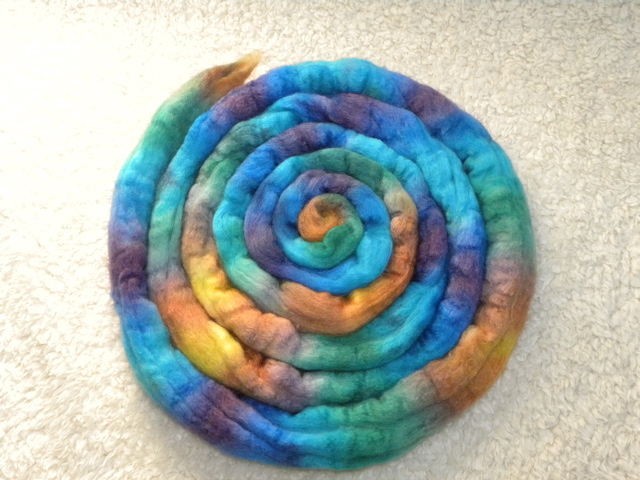 This was the third roving I dyed. 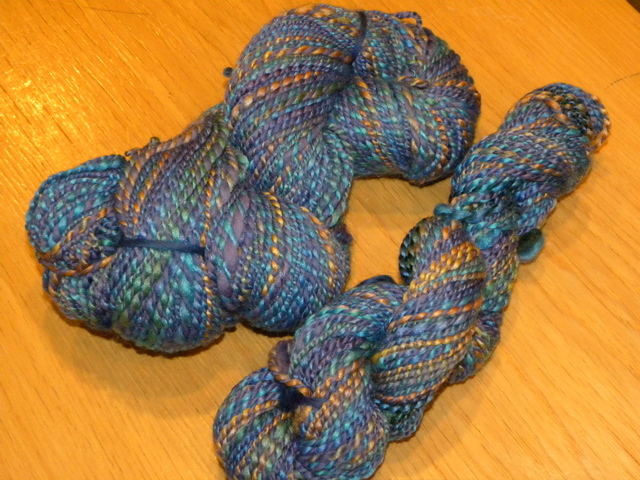 It’s a Merino and Silk mix and it was named Age of Aquarium, (a great name suggestion by Breida with a B). Well, one of the knitting/spinning geniuses I knit with on Sunday night, Deb, bought it from me and spun it into gorgeous yarn. Isn’t that COOL!!?? I’m in love with it! wow! I’m really surprised at the diference in the “feel” of the yarn as compared to the roving! I would have expected to see a lot more of the bright aqua color in the finished product (actually, this is not the finished product – i hope you can post a picture of whatever she knits this into!). The yarn is stunning and the colors seem very wearable – the roving was gorgeous and vibrant but seemed a bit loud for my personal taste in, say, clothing. I’m wondering how much of an idea you have in your head of how the spun yarn will differ from the roving and if the way the yarn is spun makes a difference in the outcome. wow that’s so beautiful. what a difference… can’t what to see how it knits up. i wish i had a knitting group like yours. amazing!!! © 2019 Mustard Seed Yarn Lab / Site designed by this guy.